the serverless school: Print Options with Google and Chromebooks. The standard way to print from a network device is to install a driver for the required printer model. However you cannot load print drivers onto a Chromebook. In fact you are not allowed to load any driver onto a Chromebook. This is one of the features that make Chromebooks so secure and stable. 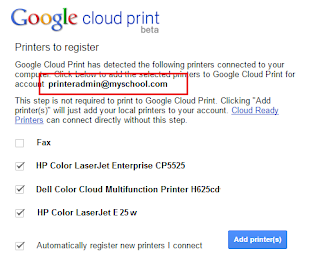 For most schools the solution is implement Google Cloud Print. However to provide a complete picture it's worth mentioning some other approaches and how these relate to Google Cloud Print. With Version 57 Chromebooks gained support for Unix-style print standards—the CUPS (common Unix printing system) system that uses IPP (internet printing protocol). The problem with deploying CUPS printing in a schools is that it’s still very new and there doesn’t appear any method to control the actions from the admin console so mapping printers is a manual exercise on each device. However it’s worth testing it out as it may prove a useful solution in a specific situations. There is a second option for direct print. HP printer users can install the HP Print for Chrome app. This is not a driver but controls printing to HP devices using a Chrome extension. Using this you can print from a Chromebook (or any Chrome browser) to HP Printers connected on the same network. Again there is no way to control this through the console so it’s a manual action and if the Chromebook is on a different VLAN to the printer (which is often the case with wireless networks in schools) it’s not going to work. Support is a problem - so like CUPS printing this is only really suitable if it meets a specific requirement. Which leaves you with Google Cloud Print. 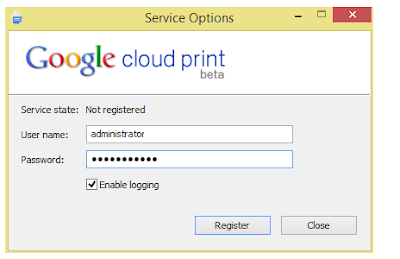 Google Cloud Print uses a generic print service installed at part of the Chrome browser to format and transfer a print job to Google where its sits a queue waiting for an inbound connection from a printer. The advantage of this process is that a Chromebook does not have to be on the same network as the printer to send a print job - in fact so long as it has an internet connection it can print from anywhere in the world. The downside is most of the advanced print features are missing. If you are hoping to make use of the stapling and collating features you are going to be disappointed although the basic options such as quality, paper size, number of copies, margins and duplex are be supported. Setting up Google cloud print is fairly straightforward. There are two steps to getting it going. Advertising the new cloud printers to the client devices. Most vendors now include the facility for printers to advertise directly with the Google Cloud Print service. In fact you would be hard pressed to find a high end printer sold in the few years that is not “Cloud-Ready”. Google maintains a list of supported printers which is pretty comprehensive. Each vendor will provide a set of instructions that will allow you to enable the printer with Google but the basic process is the same. Before implementing Cloud Print check the firewall connection between printer and Google. All of the traffic is outboard from the printer on standard ports. Therefore you must have port 80 and port 443 open to outbound traffic from the printer's IP address. In addition you must open port 5222 outbound to talk.google.com. This port allows the printer to advertise it’s status to Google. If it’s blocked the printer will be created but then go “offline” after a short period. All the cloud printers with Google are owned by a user account in your domain. This can be any account but essentially this user becomes the print administrator. Obviously if that user's account is subsequently deleted or suspended you also lose the print queues, which is situation to be avoided if at all possible. Therefore its a good policy to create a service account to specifically to manage the printers. This account does not have to have any special administrative rights. Once the account is created you can logon and access the print queue by navigating to the print management console. For each printer enable the cloud ready option following the manufacturer's instructions. At some stage it will ask for the details of the Google print account and the printer will visible in the console. The disadvantage of the Cloud Ready approach is that there is limited control of the print jobs and each printer is set-up individually. In fact it's more likely that a school will already have a print server in place that advertises a number of printers to Windows and Mac clients and may also run older printers that are not Cloud Ready. In this case you would fall back to using the Google Cloud Print Service. Installing the Google Cloud Print Service. This a local service that runs on the print server that advertises all printers to Google Cloud print. During the installation you get the option to choose which printers you which to publish. Installation is very simple, Download the installation from the link below and run the install. Once launched it requires details of a AD account that has rights to manage the printer accounts and install as a local service. 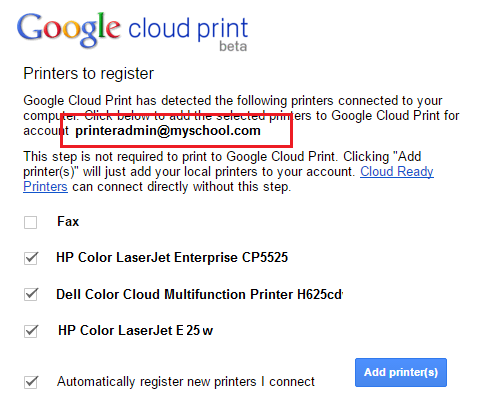 It also requires details of the Google account you have identified to host printer queues - in this case printeradmin@myschool.com. At this point you can select the printers to publish and also enable an auto register feature. After a few moment the printers should be visible on the cloud account. Note that in this case the you must have port 80 and port 443 open to outbound traffic from the server's IP address as well as open port 5222 outbound to talk.google.com. You do not need to open any ports from the printer addresses. The last stage is to share the printers to your users. This is done using the Share button from the cloud print console. It's pretty simple to share a Google Cloud printer with another individual account but in academic environment that's fairly impractical, you really need to share to a group. Assume that your print account is printeradmin@myschool.com. 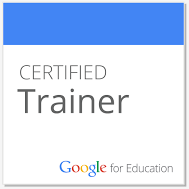 Create a new Google group called “HP Colour Laser Jet Users” for example. Add printeradmin@myschool.com as an owner of the “HP Colour Laser Jet Users” group and share the printer with that group logged on as the printer@myschool.com account. Access the printer@myschool.com email account and accept the shared printer for the entire group by accepting the e-mail. When you share with groups, the group administrators receive the invite and they can accept on behalf of the group. Alternatively if your personal account is already the owner of the group you can accept the invite on the users behalf. 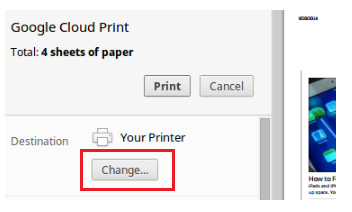 Your Chromebooks user will now see the printer when they open the print dialog and select Change button under destination. Adding a new user to the “HP Colour Laser Jet Users” group does not automatically advertise the printer with the user. This action is the same for printers as it is for documents. The workaround is to remove the group from the printer share and then immediately add it back in again once a change has been made to the group membership. Its worth noting that the Google Cloud Print Service has a reputation for being somewhat unreliable. Some schools overcome this by periodically restarting the service on a schedule using the command set below. It’s possible that you may not have access to the local print server or have sufficient rights to install software or have any servers at all! In this case you could consider the Lantronix xPrintServer, an easy-to-use, plug-and-print appliance for Google Cloud Print. 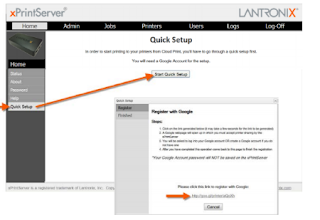 The Lantronix device is fully supported and generally provides a more robust service than Google Cloud Print Service running on a Windows server. The setup is done through a setup wizard rather than downloading the Google Cloud Print Service. Integrating Google Cloud print with a Print Management Solution. There are some features that Google Cloud print does not support. These include a comprehensive reporting/quota system and a follow-me capability. Integrating with a third party solution such as PaperCut solves these issues. Recent releases of PaperCut have native support for Google Cloud Print as well as integration with the Google user directory.